This Canadian easily makes the cut as the most accommodating barber in Québec for the way he makes haircuts bearable for super-sensitive children with autism. 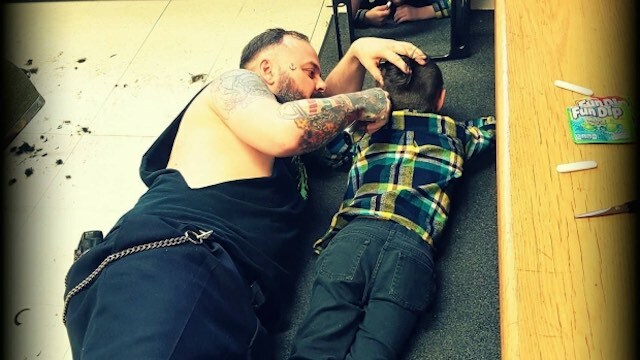 A recent photo of the good-natured barber, Franz Jacob, shows him down on the floor with Wyatt, whose mother posted on Facebook praising the “everyday hero” for the care he gives his special clients. The six-year-old is both hyposensitive and hypersensitive, so having his hair touched can feel unbearable, his mom, Fauve Lafrenière, told CBC News. Jacob’s salon Authentischen Barbier is the only shop where Wyatt gets the welcome and sensitive care he needs.